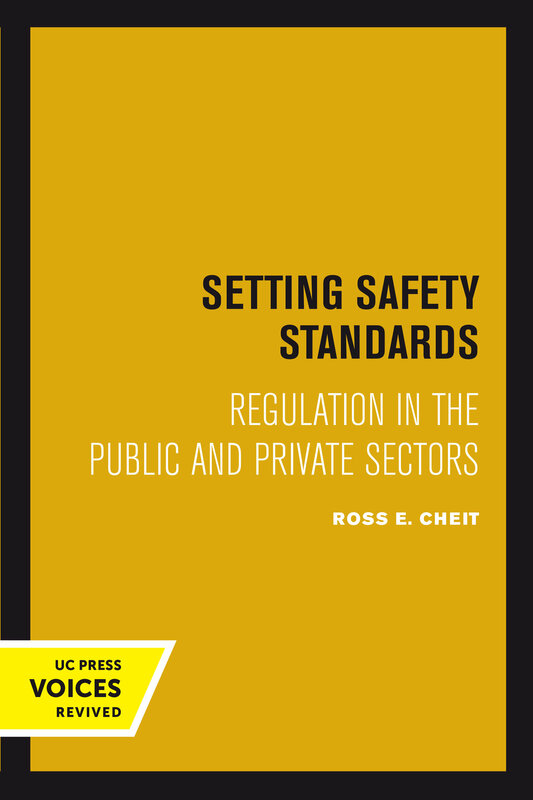 In this highly original and meticulously researched comparison of public and private standards-setting, Ross E. Cheit questions the old maxim that government-set safety standards are too severe while those set by the private sector are too lenient. Identifying the comparative institutional advantages of each arrangement through four paired case studies of grain elevators, woodstoves, aviation fire safety, and gas space heaters, he finds instead that some private standards are surprisingly strict, while government is better positioned to survey real-world experience and sponsor research likely to improve standards-setting. Setting Safety Standards challenges those political scientists who argue that only public institutions can advance the public interest in the controversial field of health and safety. Cheit draws attention to such little-known organizations as Underwriters Laboratories and the National Fire Protection Association, private-sector alternatives to the government regulation so frequently criticized as time-consuming, inflexible, and unreasonable. These organizations, he shows, play a far more significant role in regulation than most federal agencies, even though the standards they develop are widely—and often mistakenly—assumed to be less concerned with due process than government standards and often unduly lax. This study should be widely read by public policy and regulation experts in both the public and the private sectors as well as by academics in the field. This title is part of UC Press's Voices Revived program, which commemorates University of California Press’s mission to seek out and cultivate the brightest minds and give them voice, reach, and impact. Drawing on a backlist dating to 1893, Voices Revived makes high-quality, peer-reviewed scholarship accessible once again using print-on-demand technology. This title was originally published in 1990. Ross E. Cheit is Professor of International and Public Affairs and Political Science at Brown University.